Disney does digital: the Toy Story story, anyone? Disney has opened its doors to digital children's books for the first time, marking a new era for the Mouse House in terms of how it distributes its classic tales. 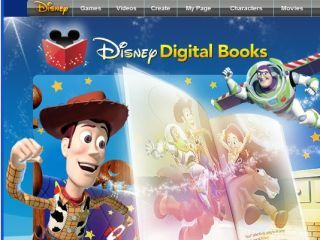 The website, www.disneydigitalbooks.com officially launched today, with the onus very much being on browser-based reading. Instead of utilising the current influx of e-readers, kids and adults will have to log on to the website and choose from the current 500 titles that are on offer. Disney is certainly pushing the interactivity of the website. Each book will have sound effects, and there's even the option to hear words pronounced – great for younger kids who may be still learning to read. All this technology comes at a price, though, with a monthly subscription to the service costing $8.95 (around £5.50). When you sign up, though, you will get seven books for free, including an interactive 'look and listen' book. And if the kids are fed up with the stories, they can create their own with the in-built story builder. Find out more by logging on to www.disneydigitalbooks.com.